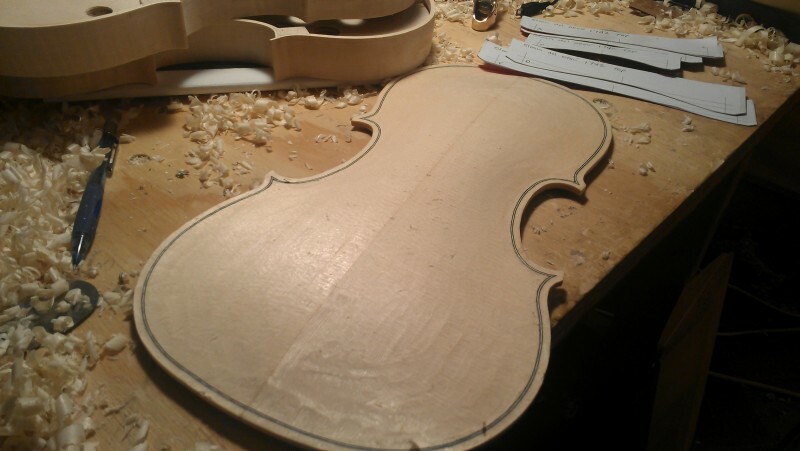 that is being “copied” (from a Strad poster) in the workshop. I went again to the library with one of the violin makers so that we could print those templates, and then we stopped by a little drug store to pick up a few items to help in our template making: A stick of school glue and a couple of folders made of stiff paper. We were improvising. Once back to the workshop, we set about gluing our printed templates onto the folders, and then we cut them out. They’re a bit rough, but they will do until I can make some better ones. With templates in hand, I started working down the long arch of my del Gesu top. Michael works in stages–rather than trying to get it all down to the correct arch height in the first pass, he’ll shape the whole plate, then bring it down in successive passes. As I was getting to my second template station or so, Michael came over and pulled me aside for another half hour one-on-one lesson. This time we talked about purfling (especially corners), the scoop, and the ff-holes. I got some great information that will help improve my work considerably. I continued my arching work after lunch hour. 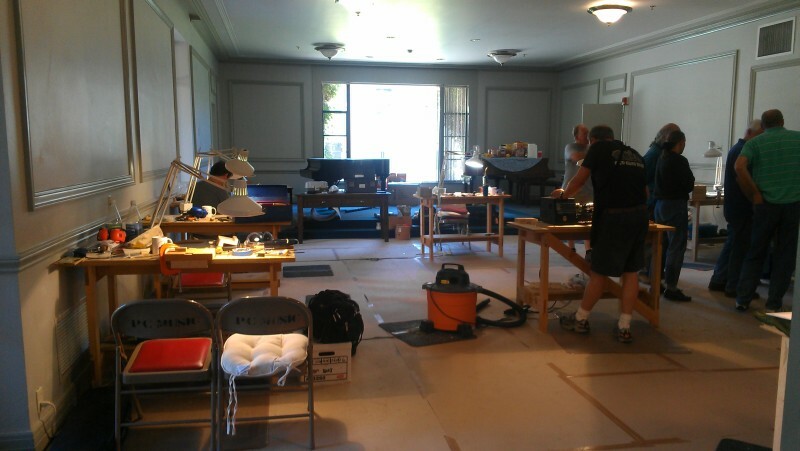 We took group photos around 3 pm, and some of the violin makers started packing up and heading out. I planned to work as late as possible, but I decided to get some dinner first. In the meantime, some of the others had brought in fine cheese, bread, crackers, and wine. Jim Brown, who owns a violin shop in Claremont and sponsors the workshop, made his own shrimp cocktail sauce. I understand he was nearly a contestant on the TV show, Top Chef. I arrived from dinner while this event was still in progress. I had to try some of Jim’s sauce, and it was terrific. Having partaken of good food and ample drink, my colleagues began to relax, and soon there were groups gathering for warm conversation. An impromptu string ensemble organized spontaneously in the hallway. The atmosphere changed from one of industry and learning to one of satisfied enjoyment of fine company, fine music, and work well-done. 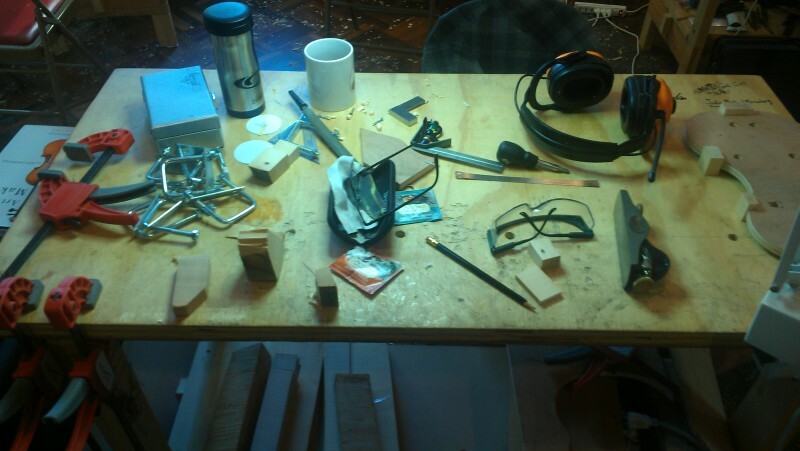 The entertainment and talk lasted well into the night, but I worked quietly at my bench. 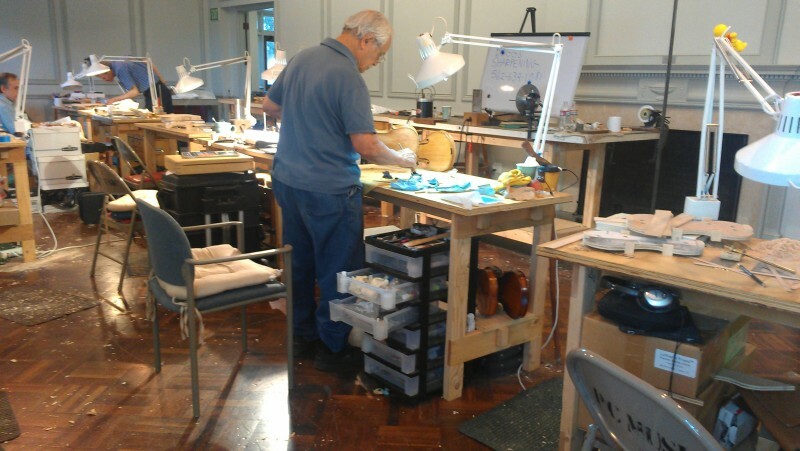 I did get to meet George Rubino, the master bow maker. He came over and talked bows for quite a while. I’ll have to think about doing a bow in the future. Here is the progress I made this week on my top plate. I’m in process of final arching. Michael Darnton teaches how to trim a bridge. An old Italian getting back to his roots. 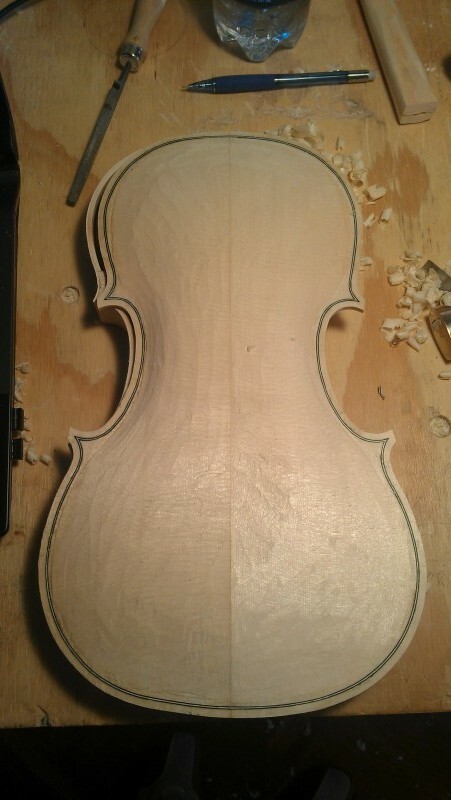 One of the violins being made. I love the inlaid fingerboard. That’s snakewood! 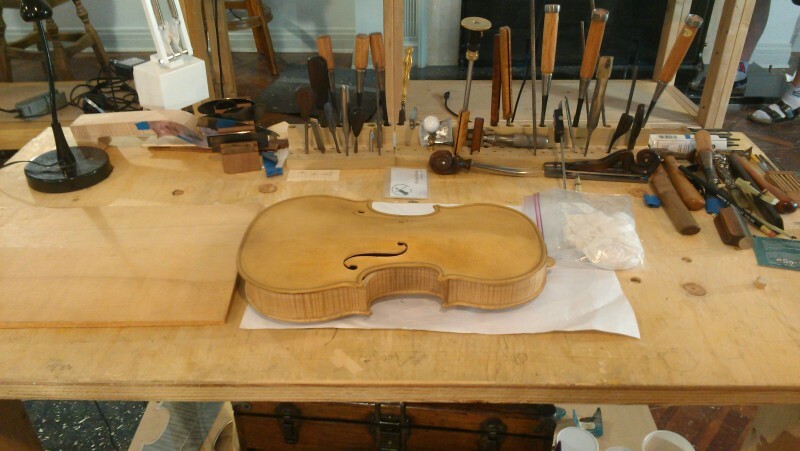 This baroque violin is another example of fine workmanship at the workshop. Today began with purfling. I cleaned up the edge of my top plate and ran a purfling rout 4mm in from there. 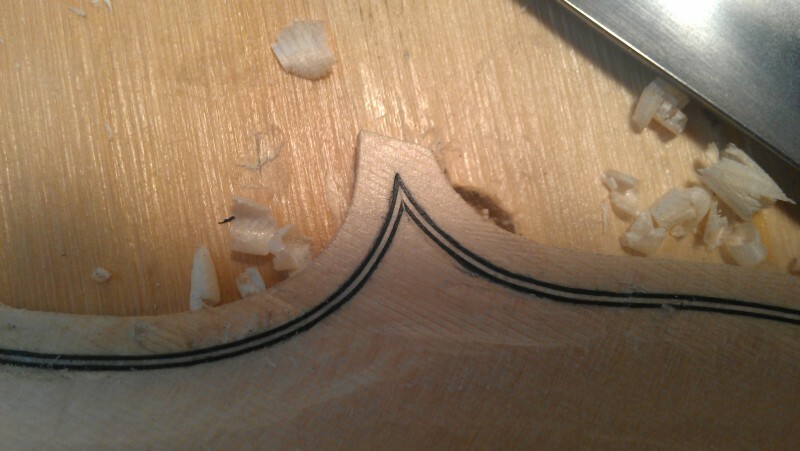 The corners are always tricky, especially in spruce, and they require deft knife work. 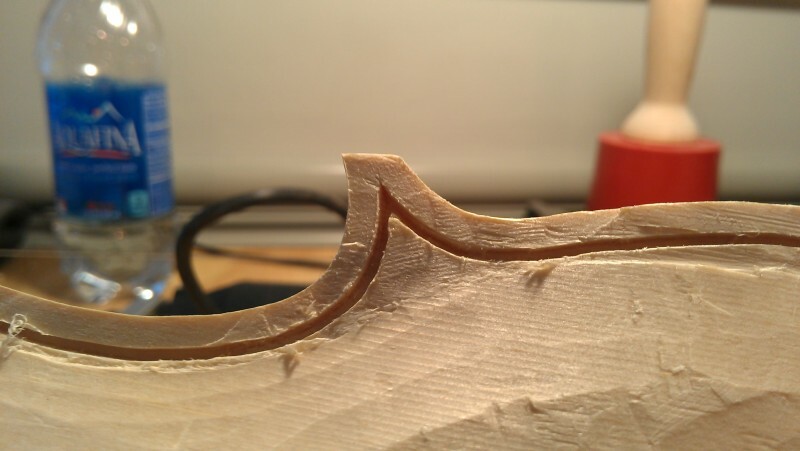 It’s also important to get the tip equidistant from the three sides of the corner, and you need the right curve, and so on and so forth… My miters turned out OK, and I’m happy with the points of this purfling. Keep in mind that del Gesu didn’t do the fancy, long points that Stradivari and Amati used. I used this modified compass that Michael Darnton made to scribe the corner purfling before cutting the corner routs. 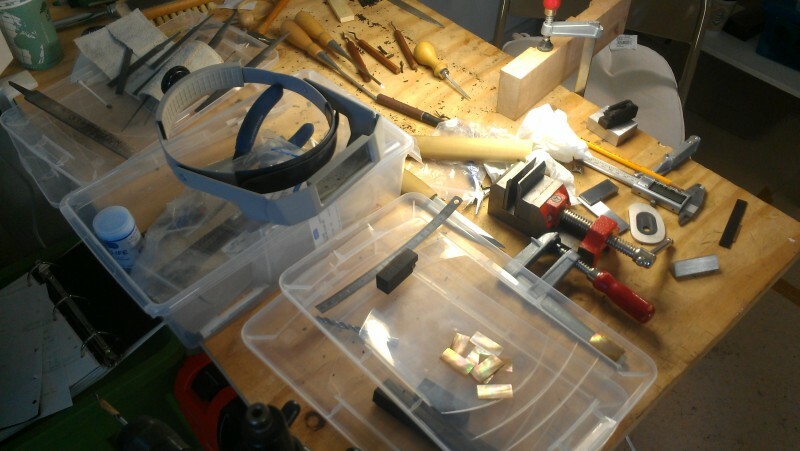 Violin makers have to make a lot of their own tools, and sometimes they can get pretty creative! 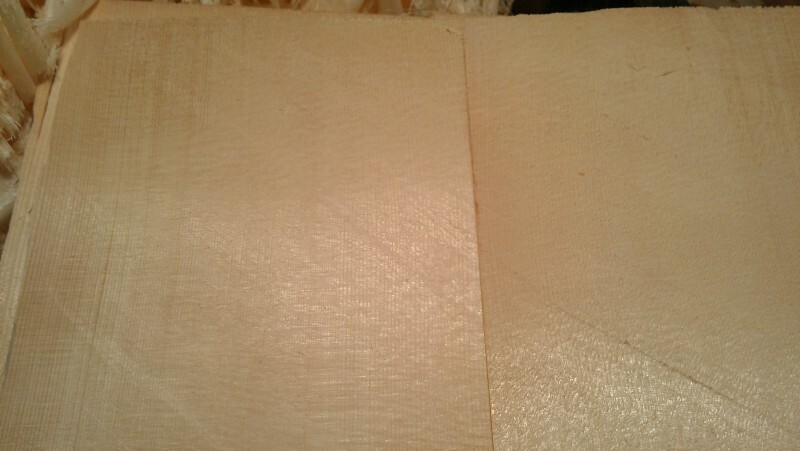 Here is a finished corner rout that I cut with my knife and purfling pick. 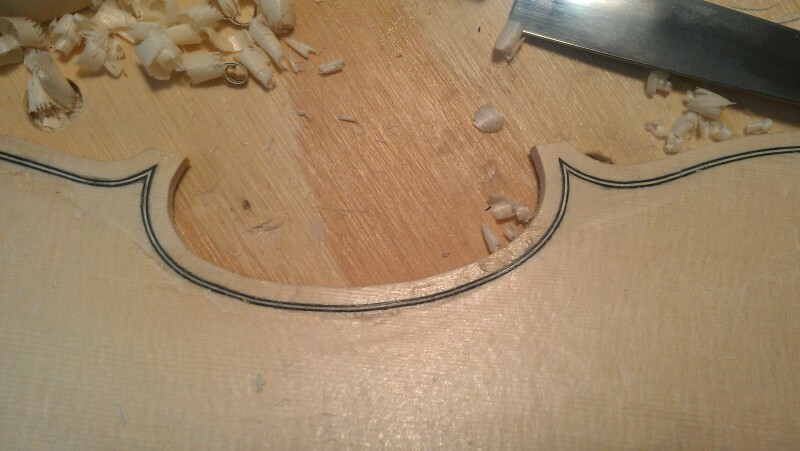 Here is some detail on a couple of the corners with the purfling inlaid. I’m pretty happy with the result, though there’s always room for improvement! A close-up of one of my corners. Bartruff taught me to do purfling very late in the process. The reason for this is that sometimes you have to adjust the edge a little bit, and if so, then the purfling won’t look right if it had been installed early. 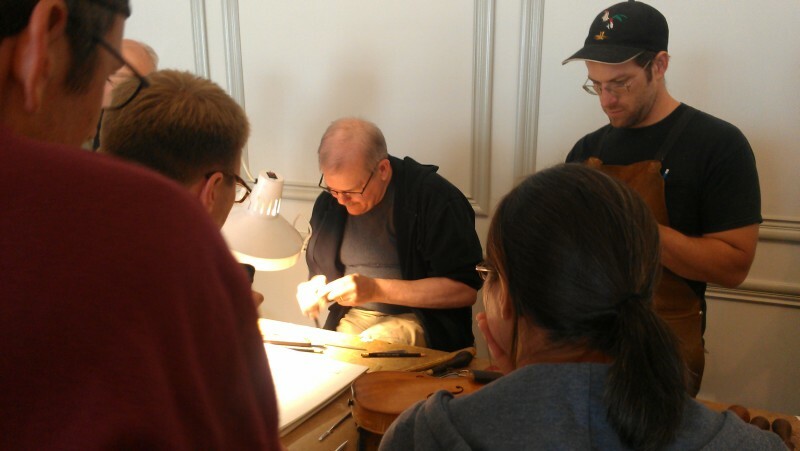 However, just about everybody at the workshop does purfling very early, before any final arching, because adjustments to the purfling channel can alter the arch shape… and Michael Darnton believes the arch to be one of the most critical aspects of the violin. Purfling took me all of the morning and into the afternoon. The only other thing I did was to hand out a few band-aids (thanks, Jodi!). 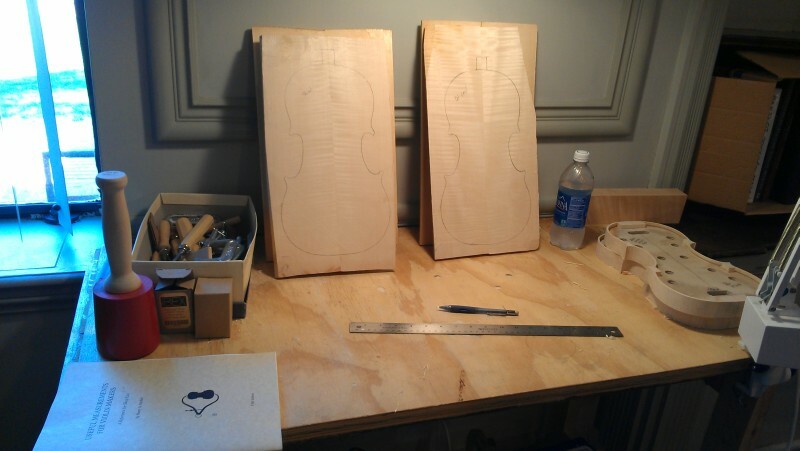 In the afternoon, I spent some time teaching a neighboring violin maker how to use the computer to design arching templates. I suspect he found it a little bewildering; technology isn’t usually a forte among this demographic, although there are a few who are quite adept at computers as well as violins. After the computer exercises, I decided to take a little break and visit the bow making workshop to see what they were up to in those quarters. I remember Will Bartruff telling me that he had once done a couple of bows, and he said it was hard work. 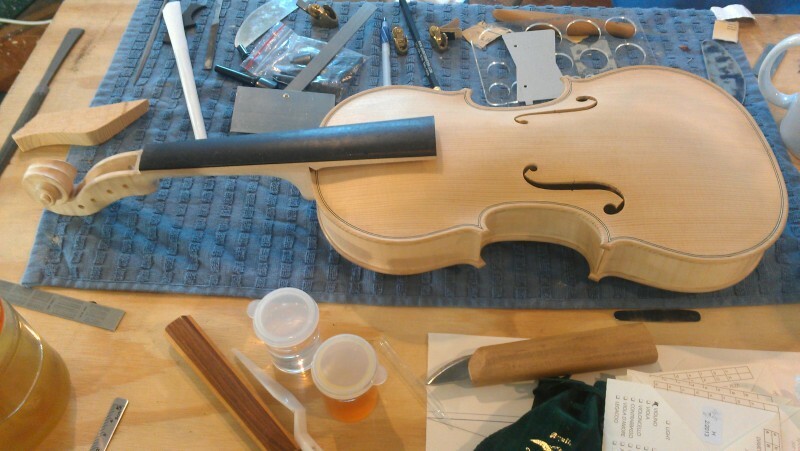 Violin makers don’t often make bows. A bow maker is called an archetier, and he or she is at least a part-time jeweler when making a bow (as one of the participants pointed out to me). 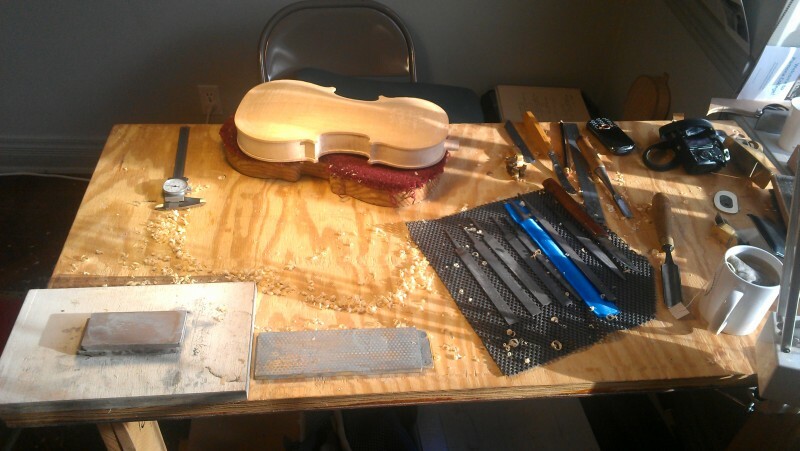 The frog of a violin really is jewelry, and it is quite an involved process to make one. Here are the tools of a bow maker. Much of what you see here is being used to make an ebony frog. Those little pieces are more complicated than you might think! You know those little rings and such that you see on a bow? Many of those things have to be forged or shaped from raw silver or abalone by the bow maker as part of the process of making a bow. It’s not like they come in different sizes at the hobby store, and you pick the one you want to put on. I was quite impressed with the amount of workmanship that goes into a hand-made bow. I understand why they can get so expensive. I made the acquaintance of a few of the archetiers. One of them is learning to play cello and is making his own bow. He gave me some good advice about learning an instrument: More than simply getting a good instructor, he said, it’s important to find a local group or orchestra that will let you play along. He related the story of when his little community orchestra was invited to play at a book signing for a title on the subject of the 1936 Berlin Olympics. One of the champions from that winning team (now an old man) was in attendance and seated in the front row, so this new acquaintance of mine knew he had to play as best he could in spite of being a beginner at the instrument. After the event, they all received some genuine compliments from that gentleman and his wife. That sort of experience makes more of a difference than simply sitting at home to practice alone. And that is some wisdom from a bow-maker. I had a very curious experience this evening. 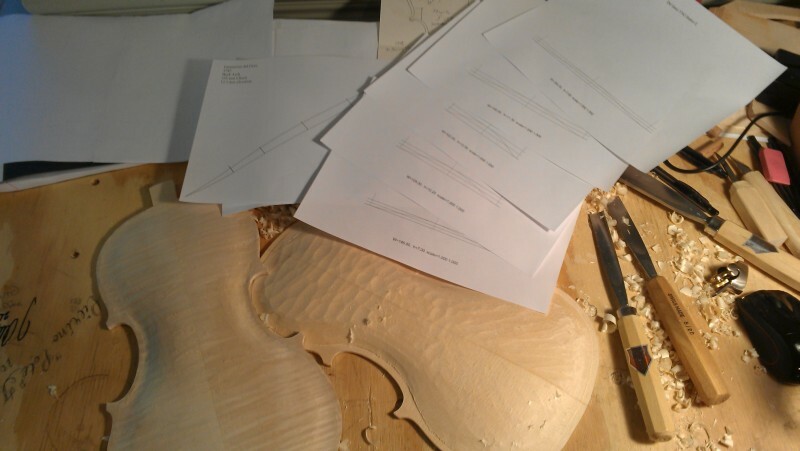 I have been working from a pattern for a 1742 Guarneri del Gesu violin. Those of you who follow violins at all know that del Gesu is often regarded in esteem as highly as Stradivari himself. Indeed, there have been times when the del Gesu violins have commanded the highest prices of any violins on the planet. How about that? There it was, my del Gesu in all of its original glory! It was the ex-Segelman del Gesu, now the Sloan del Gesu (for some thirty years, I am told). 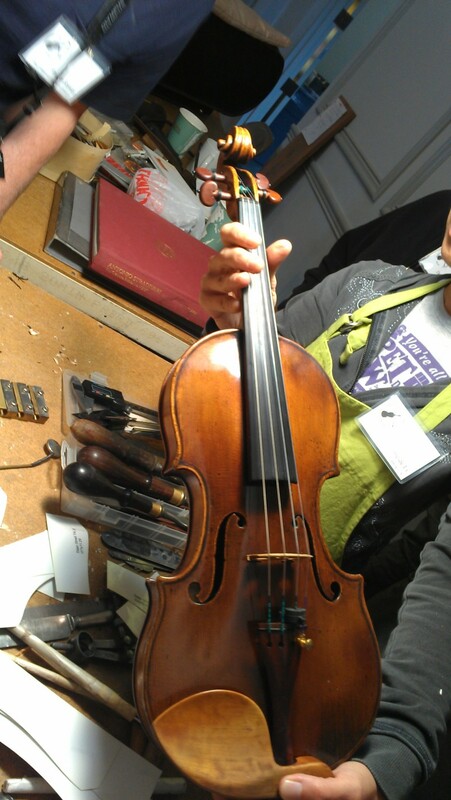 The Sloan del Gesu, being held by one of the violin makers at the workshop. As it turns out, I only had the pattern for the ribs and plate outline. I planned on using the ex-Henry Wall ff-holes and scroll patterns that Will Bartruff drew up for me. Now I have pictures of the ff-holes and the scroll on the actual instrument. What a day. That’s ME holding the Jackson Stradivarius. I had the opportunity to listen to both of these legendary instruments, and even to play on them if I wished (with a $30,000 Tourte bow, no less). Alas, I do not play the violin (yet), and so the best I could do was to look and to listen. At least I had the wits to snap a few photos. So now I’ve perused a couple of Strads and a del Gesu on this little trip of mine. It’s a little bit surreal and unexpected. This is my top plate, all purfled up and ready for final arching. This is where I ended with my back plate. I still need to cut the corner routs and put the purfling in. I love the maple I got for this violin; it’s almost quilted! Day three was the busiest day yet. 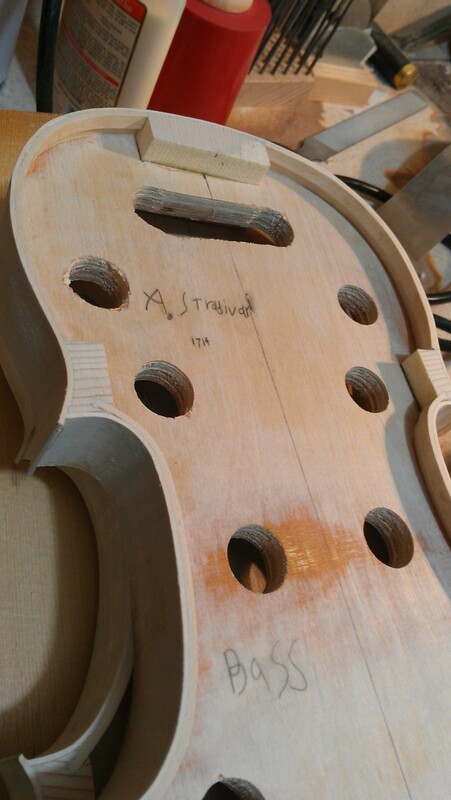 I started out by rough arching the top plate of my del Gesu. Then I calculated the long arch for the back plate. This arch is defined by a segment of a circle for Cremonese instruments, and I determine this segment by first measuring the “chord” of the circle and finding the elevation of the arch that I want. I can plug those figures into a formula and get the radius of the circle I need to draw. I drew the circle to scale in Inkscape (it’s a BIG circle!) and intersected it with the chord, which is a line that represents the length of the long arch from one low point in the purfling channel to the other. Then I set about defining stations along the length of the long arch where I wanted to calculate curtate cycloids. I put a total of five on my line, one at each maximum or minimum width of the plate. Given the width of the plate and the known height of the long arch at each station (which can be discovered in Inkscape), I was able to calculate the cycloid arches that will be used on this particular instrument. 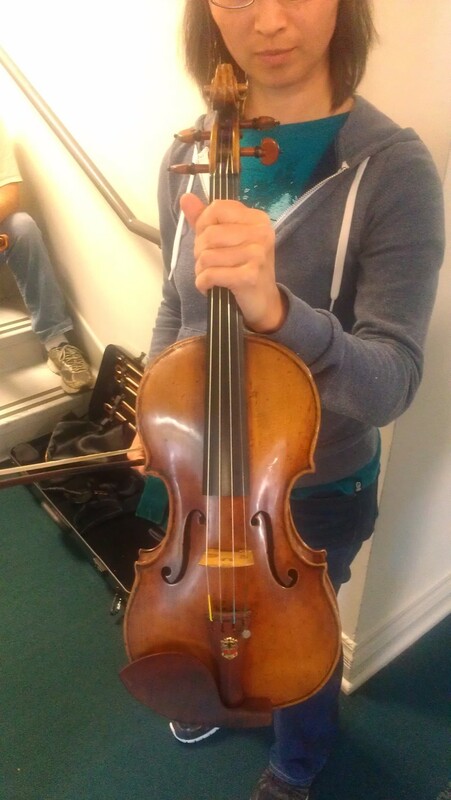 I was able to handle this instrument (I could only touch it on the neck and chin rest) and examine the workmanship. It has such a long history that it is a little difficult to see the original skill. For example, the corners are nearly rubbed off and some of the edges too. The scroll has been similarly smoothed by time and much use. The instrument has seen many repairs over the years, but in general is in good shape. I did see some of Stradivari’s amazing corner purflings, and I noted that his back joint wasn’t quite perfect. That made me feel better about some of my own joints. 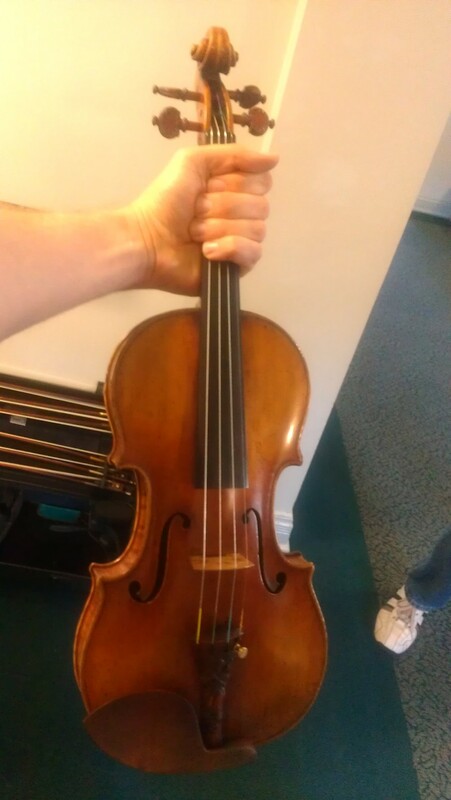 1) It is difficult to discern the art of the violin based on worn originals. It’s lucky that there are still some fairly pristine specimens in existence that show just how Strad did his corners, for example. So we try to use those specimens as ideal forms in order to recreate the old, worn out fiddles as if new again. I realized that I shouldn’t be attempting to reproduce the exact outline of the patterns I have, because chances are they represent a good deal of wear and not the instrument as it was originally made. 2) Players really do have to fight with these temperamental old instruments, although they certainly sound fine on their good days, like today. I’m reminded of Michael’s claim that good violins aren’t the ones that automatically sound great in the hands of the 15-year old High School kid. They’re the ones that professionals have learned to coax and persuade until they give up their gold. 3) A Strad has the power to cause quite a stir in a room full of violin makers. We nearly missed lunch hour. 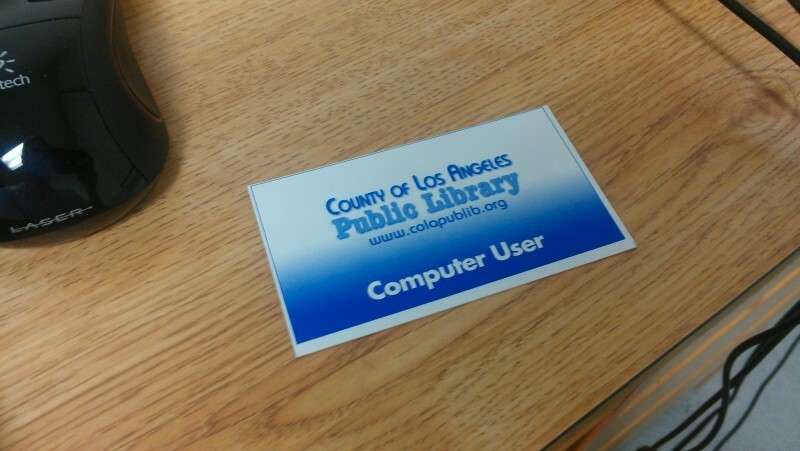 My Claremont Public Library computer-use card. I wanted to print my long arch and the cycloids that I made earlier in the day, so that I could have templates to start my arching. After the library, I asked Michael to help me refine my del Gesu corners. We looked at the circles on the plan that I used, ignoring the worn looking, rounded corner shapes and imagining what they probably looked like when the violin was new. I spent some time carving those down and getting them just right. Then it was time for some more sharpening. 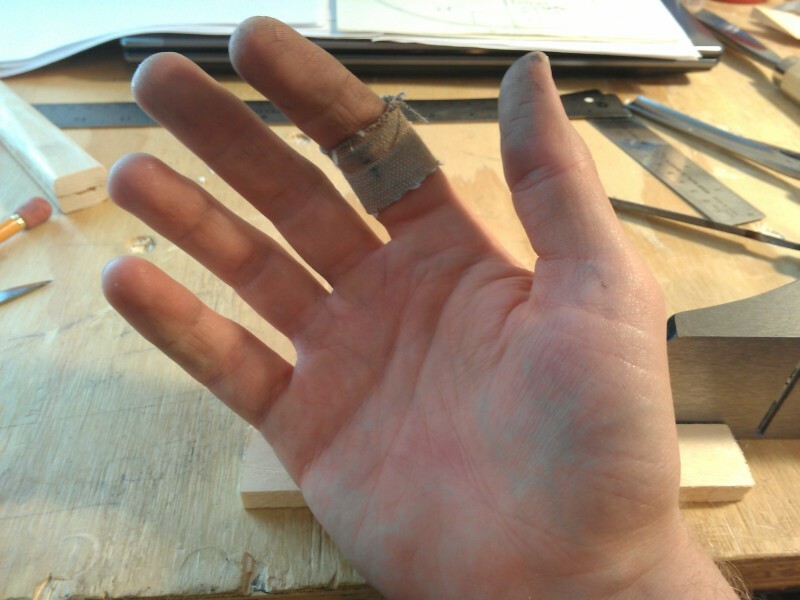 I spent some time at the grinding wheel, turning my knife blade into metal dust. I must have inhaled half of my d@#4 knife blade today! 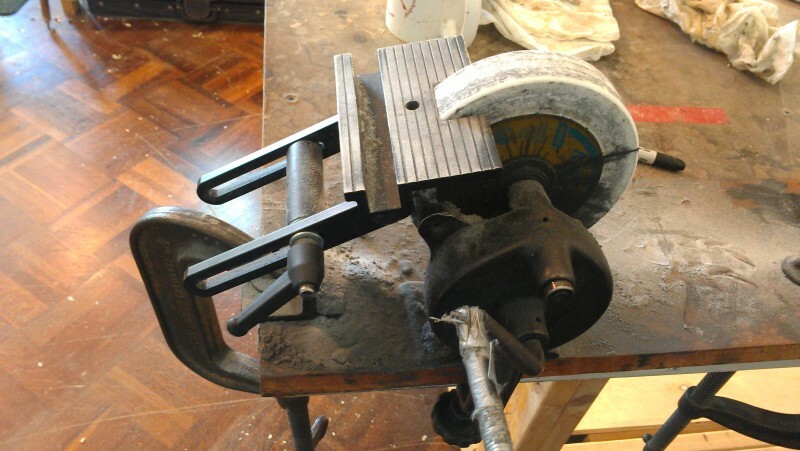 My nemesis, the grinding wheel. Anyway, my knives are sharp if not exactly neat. I made another handle for one of them. After getting my corners cleaned up, I worked on edge thickness and more rough arching. I think I’m about ready to rout the purfling channel on the top plate, then I’ll need to calculate the top arch and some new cycloids. The top arch is much flatter than the back arch. Those del Gesu corners are looking really good! Today I got to spend about 45 minutes with Michael Darnton. I had him teach me about his cycloid technique, and how to make and use the templates. Will taught me to “just wing it” when doing violin arching, which I like; but these cycloid arches are just so pretty that I felt I had to learn how to do them. 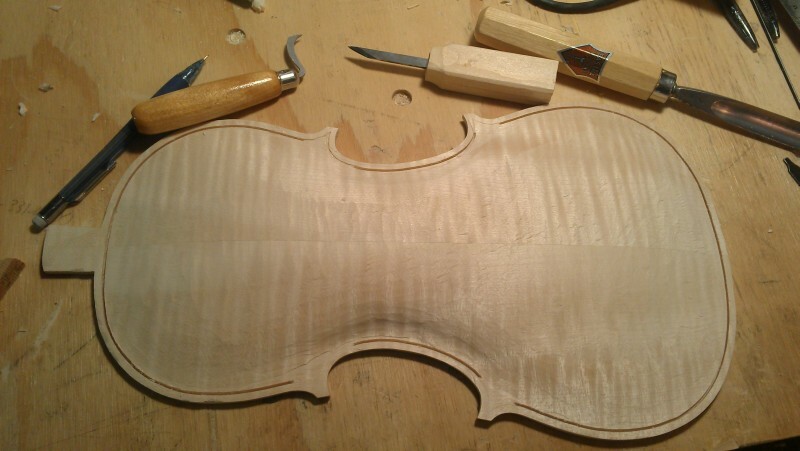 Michael believes that the perfect arching is responsible for a violin’s response. If the arching is good, then the response will be good. If it is poor, the response will be poor. He also believes that the graduations are not as important as the arching, or rather, that imprecise graduations are important! He does not go for exactness in that area. 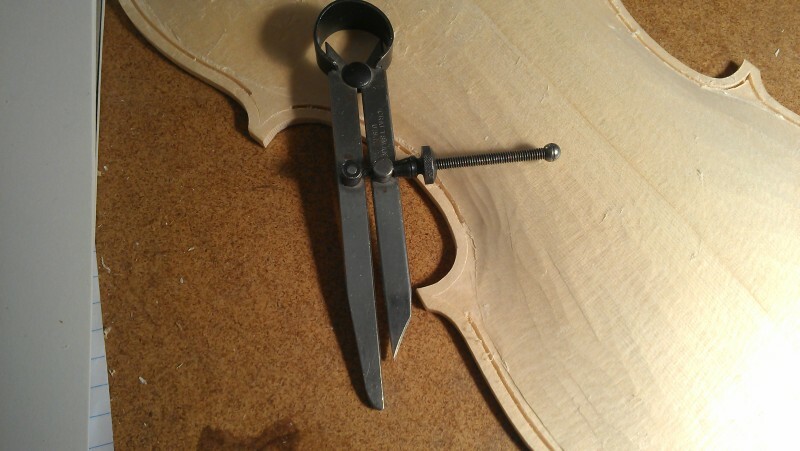 Modern makers use calipers to try and reproduce the exact graduations found in famous violins, believing that these varying thicknesses of the wood are responsible for the violin’s excellent sound. However, Michael pointed out that the old makers had no such tools as calipers and that it wasn’t until the industrial revolution that people started measuring and quantifying everything, including violins. And from that point on, Michael believes, the art of violin making has gone downhill. When violins became things that demanded analysis instead of Art, that’s when the art was lost. We looked at some response charts of modern violins that frequently win the VSA competitions and compared these to the response graph of a Strad. 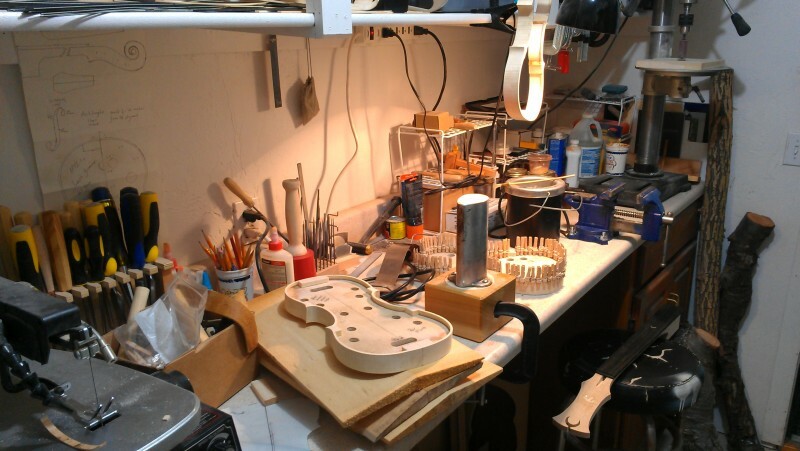 These days, makers are so intent on measuring and tuning every little part of the violin, that they produce instruments that are very responsive in a few predictable frequencies. So there are frequencies that naturally respond to that tuning, and of course there are frequencies that fight against it. Those violins sound incredible in some rather limited contexts, but don’t listen for too long! They are awfully inflexible in what they can do. 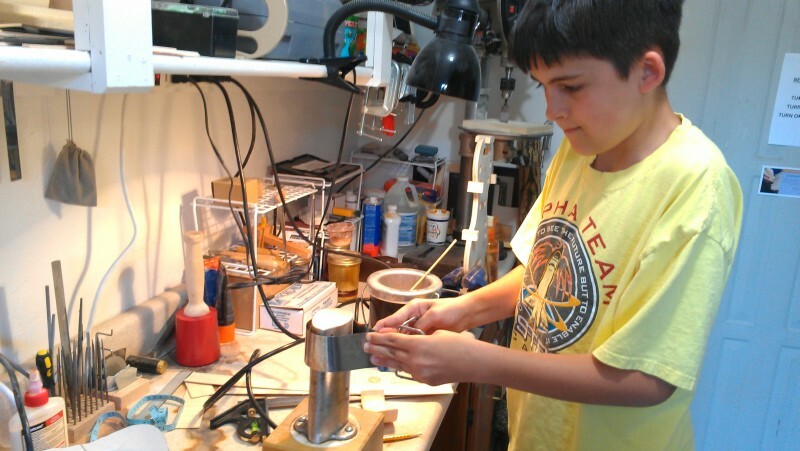 Michael seeks to build instruments that the musician must coax the sound from. You have to drive it and find the many sweet spots that produce excellent tone across the board. A violin is something that the player must discover and push to its limits, not a measured thing that is predictable and limiting. That’s a pretty good philosophy, and I think similar to Bartruff’s; although their ideas diverge in some areas. Here is the work bench of my 89-year old neighbor. Born in Italy to a poor family, he made his own pair of skis when he was nine years old. After emigrating to America, he joined the Navy and served during WWII on a hospital ship. They were docked in NY on VJ day when he was in Times Square. “You know that picture of the sailor kissing the girl?” he asks, “That could have been me! We were kissing everybody that day.” I love listening to his stories–his Italian gusto must be genetic. Another work neighbor is a bass player in the Philharmonic Orchestra. I mentioned him in yesterday’s post. He builds basses and violas, but this is his first violin, I think. Actually, he started one last year but doesn’t like how it was coming out. I looked at it and thought it was beautiful; better than my work, I thought.This piece is based on the Titian Strad, with the corners inspired by the Messiah Strad. This maker loves to work with hand tools and even does the purfling rout by hand (on his basses too!). For this build, he tack-glued the top and bottom to his ribs in order to travel and found that he actually likes working on it this way. This work bench belongs to my microbiologist neighbor. He does very meticulous work! 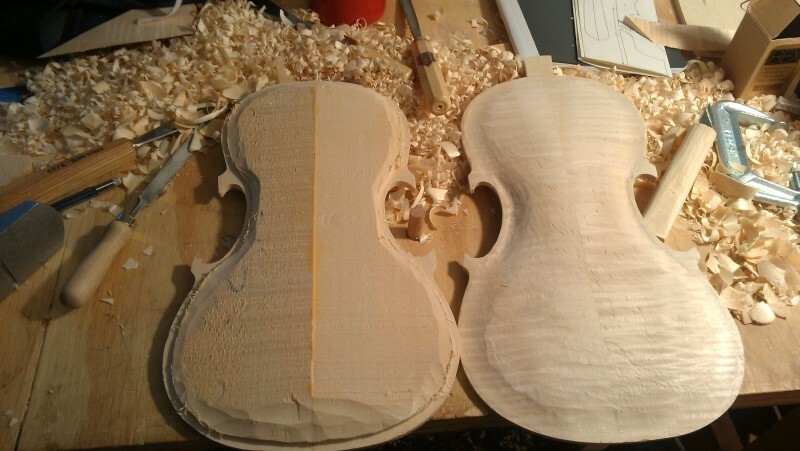 He’s doing a 3/4 Strad as well as a full size. He brought surgical loops with him to be able to see up close and get the details right. He claims that he isn’t satisfied with his first violin, but I bet it’s spectacular. At lunch time, he tells stories about how Anton Van Leeuwenhoek ground tiny microscope lenses by hand and discovered the micro-world of bacteria. Van Leeuwenhoek was looking for the thing that made pepper spicy, you see; and he found little swimming creatures instead! Anyway, this violin maker is supposed to be accompanied by his wife, who also makes violins. She has been delayed but should be here for day three. Here is a bench that belongs to one of the most interesting people I have ever met. This maker is a local artisan, and boy does it show. Those tools? Mostly hand made. Yeah. Like, the head of his brass mallet is a whale. A WHALE. The handles of his chisels and gouges are strange and fantastic sea creatures. He has bits that attach to other bits via super-strong magnets. He knows all about shaping and hardening steel, casting brass, and what-have-you. He’s a musician and plays–I don’t know–everything, including slide guitar. And he makes guitars and lutes and who knows what else. Look at that violin! It’s his first one, and it’s amazing. He covered it with fresh propolis that some lady scavenged from an enormous, active beehive. She bagged it and ran, and didn’t get stung even once. Or, so she says. *Sigh* Why isn’t my mallet a freaking whale? WILL THE KING OF SPAIN PLEASE SPONSOR ME SO THAT I CAN BECOME AWESOME LIKE THIS GUY? He never stops. He’s always inventing and making cool new stuff. 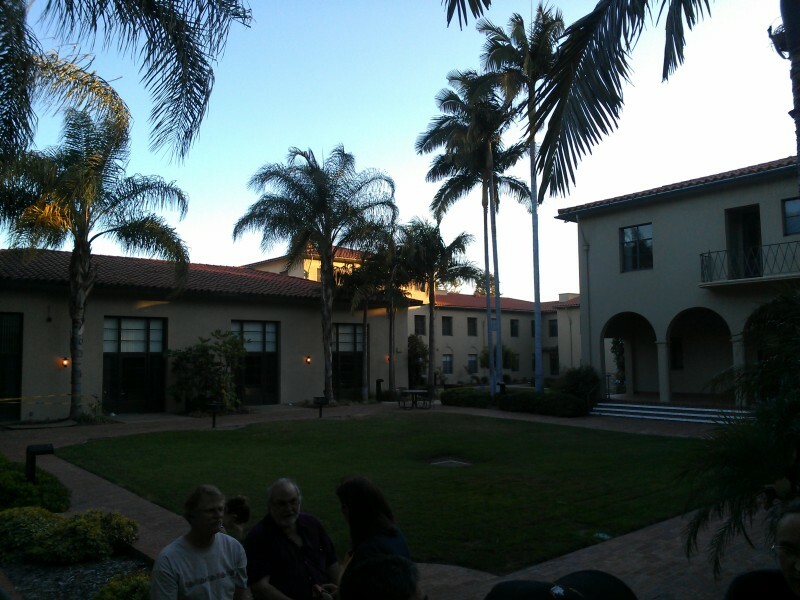 Well, I could go on about the doctor who owns a Strad and a del Gesu, or the violinist from Reno whose arching is so beautiful that it makes me want to cry or something; or the man from Australia who flew up to California just to attend this workshop. There are even a few women makers who are doing simply stunning work. What a crowd. A bit of rough arching. Those corners are starting to look all right. There are all kinds of people here. There’s the 89-year old Italian who taught school for 50 years. There’s the microbiologist who told me how to make my own yeast (somehow the topic of authentic breads arose). Then there’s the Bass player from the NY Philharmonic who makes his own Basses. That’s audacious! Who makes a bass? I mean a big, upright, acoustic bass? And I met a man who owns a construction business and is just working on his first violin. He said that making a violin would be the ultimate achievement. That’s how I felt when I got started. Our instructor is Michael Darnton. He spent a lot of time photographing old violins, as well as restoring and making. He’s had a lot of Masterpieces pass through his hands, and he knows his stuff. 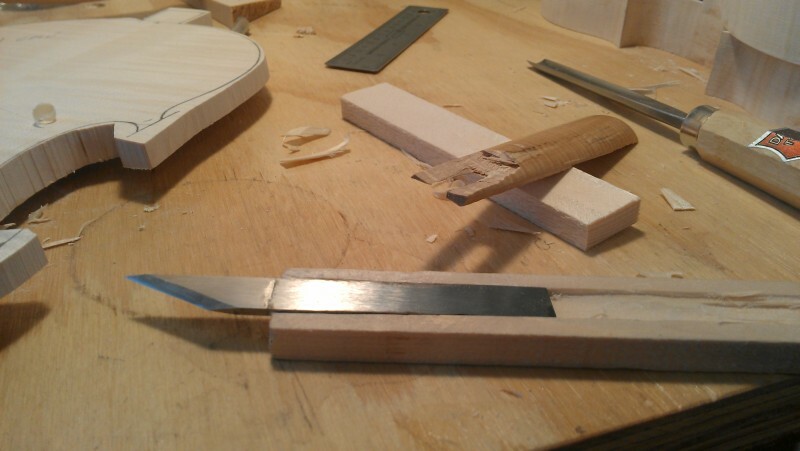 The first thing he taught me was to plane across the grain when flattening a violin back blank. In my workshop, I don’t plane them. I stick them on the 8″ sanding belt and zip them across that. 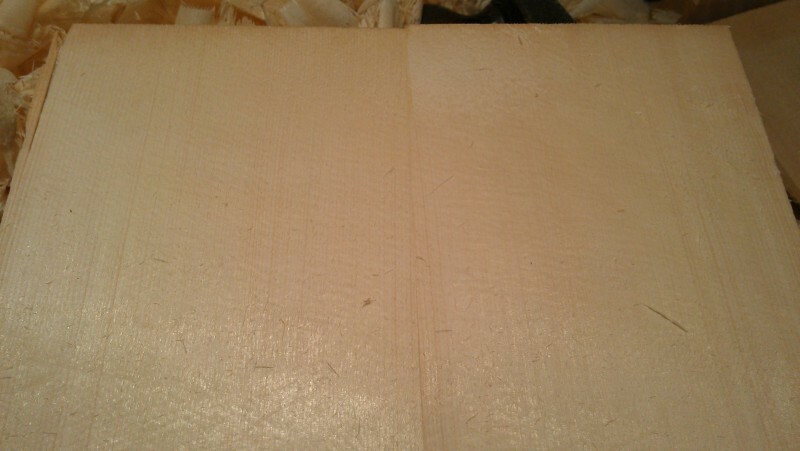 Planing produces a much nicer, flatter result, and I think I’ll do it that way from now on. Plus, it’s great exercise. “I’m sharpening my knife,” I replied. “You’re doing it wrong,” he told me. Every good violin maker needs an apprentice, right? 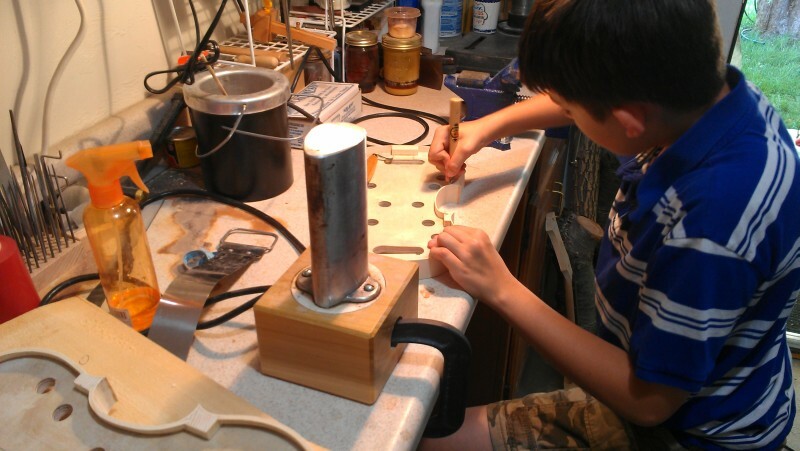 Mine is 12 years old, and I’m helping him make his first violin. For a kid with such abysmal handwriting, he’s not too bad in the shop. 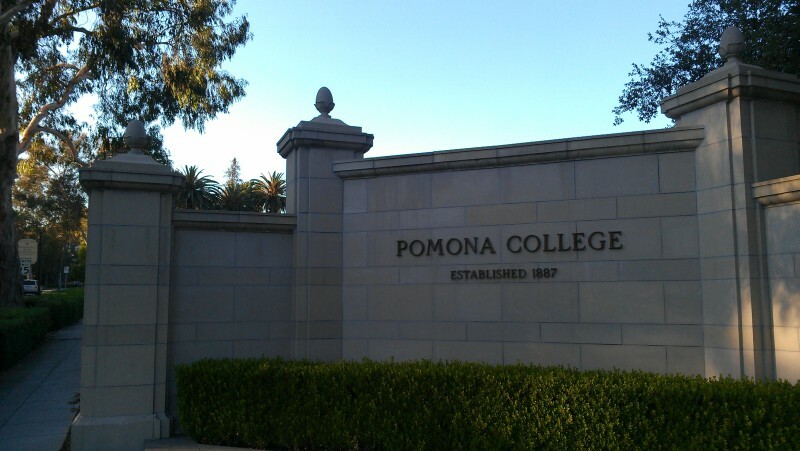 We made a 1714 Strad rib garland that I brought with me to the 2013 Southern California Violin Makers Workshop at Pomona college in Claremont. Our own little workshop. It’s small and often gets chaotic! The first order of business was to make a new rib mold, a task that was not too difficult for a kid. 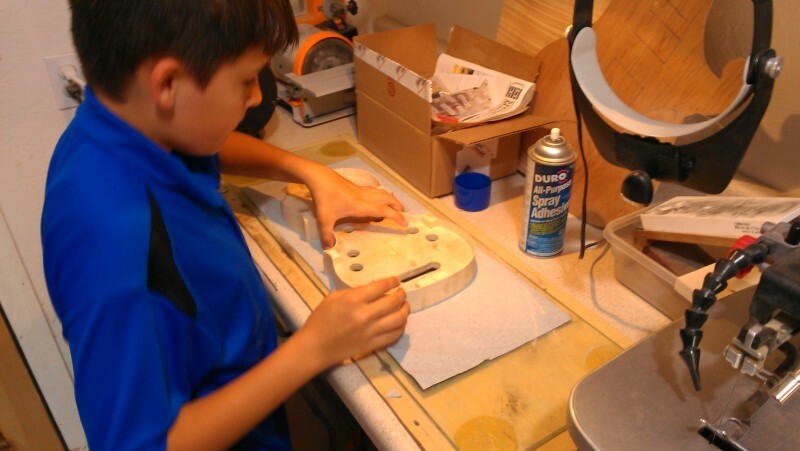 He used a band saw, a sanding disk, and a drill press. We carefully checked it against the drawings and then set it up with some blocks. 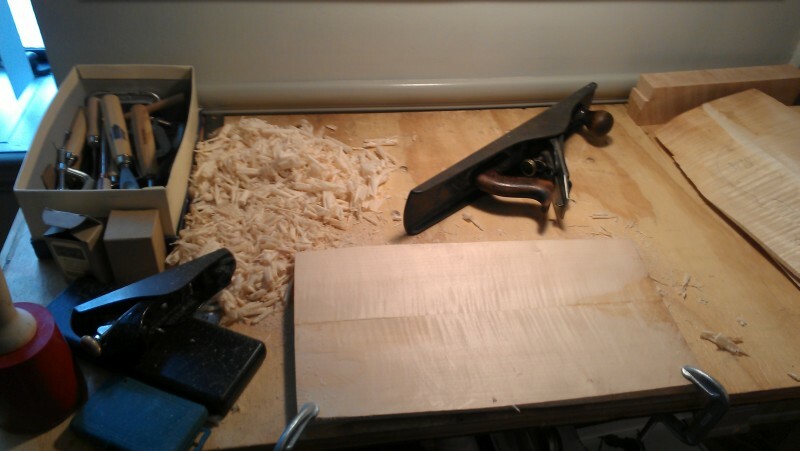 After the rib mold was staged for the build, it was time to bend some violin ribs. Bending a Rib. 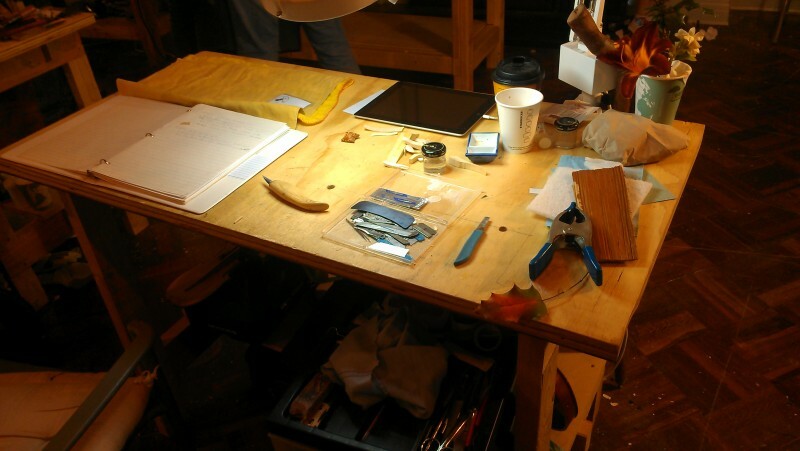 Our new rib mold is visible in the background, clamped into the bench vise. Bending the ribs proved a little tricky the first time, and we learned that you can’t let those ribs sit too long before installing them, or they get brittle and break. It took a couple of days to work through this exercise and get the ribs glued and clamped to the blocks. One of the big jobs of the apprentice is to tend the glue pot. There’s nothing more annoying than to have your piece ready to go, only to find that the glue has thickened and skinned over! The apprentice got a little too vigorous at this task and ended up cracking a rib (A violin rib, that is!) by snagging it on an corner of the sandpaper. We fixed it with some little clamps and a dab of hide glue. Luckily, the rib lining will lay across the back of that area and reinforce it. 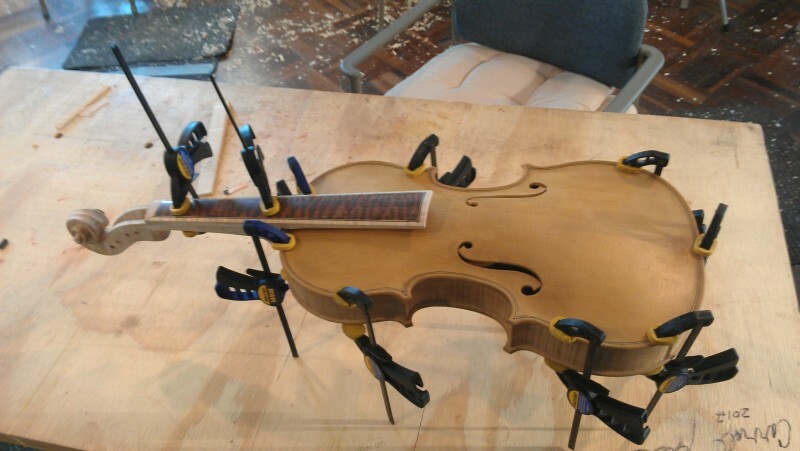 That episode did end our violin building for the day, however. I told my apprentice that we’d use willow linings for this violin, which should be easy for him to bend. Should be. Unfortunately, these linings were quite dry and brittle and not at all cooperative. We cracked a few of them before we were done, but as my mentor, Will Bartruff, once told me, “They’re just linings!” Once glued in, they’ll be good and strong. Plus, we’ll spiff them up a bit–there are points for neatness, even if it can’t be seen in the end! One of the things my apprentice seemed adept at was wielding the knife. He was doing splendidly on the c-bout blocks, preparing them to receive the waist linings. I had just sharpened up a knife to help the cause, and as soon as I turned my back, “AHHHHHHH!” the kid runs off to get the First-Aid kit. 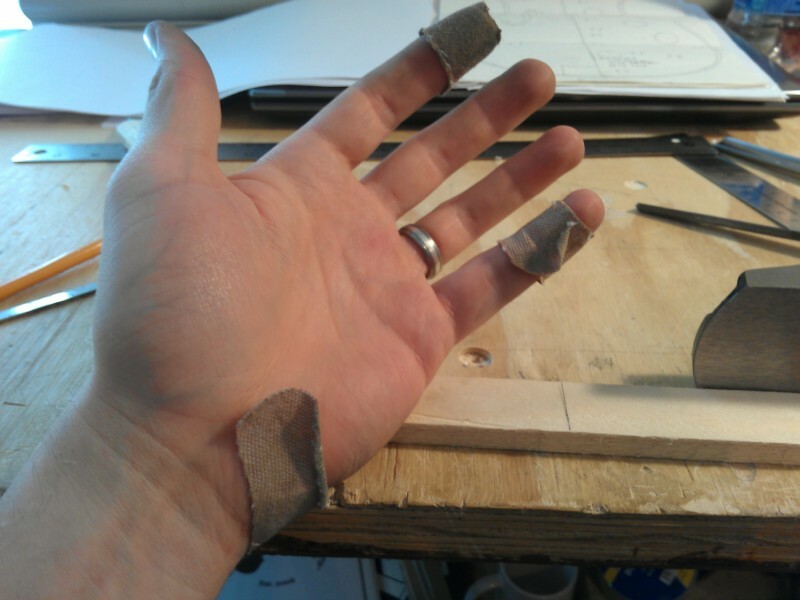 At least it wasn’t the table saw, right? Anyway, he boasted of that wound for a little while, but really, I thought it was not too bad. Well, that incident also put an end to our work for that day. At least he got one thing right: He didn’t bleed on the project. Preparing C-Bouts for Linings. Band-aids were used on this day. The final stage of this project was to actually trim and glue the linings, then clamp them. I thought this would be an easy task, but I neglected to supervise the trimming properly (or to lay out a good method to accomplish it), and my boy wrecked one of our linings in the saw. It was easy enough to bend a new one, though. After the linings, a quick rub on the sanding surface, and the rib garland is complete. As I mentioned earlier, I’m taking this one with me to the violin workshop and see what the guys there think about my little apprentice. I think he did a good job, and he learned a lot. 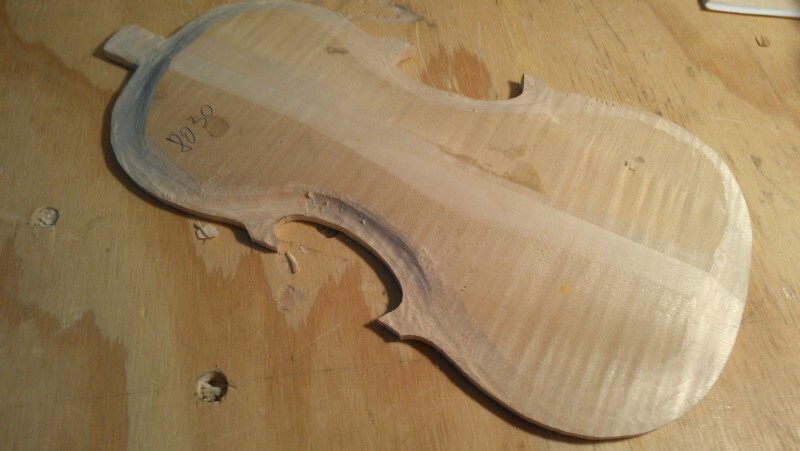 It isn’t easy to make a violin, and even less easy to make a good one. But two pairs of hands are better than one!